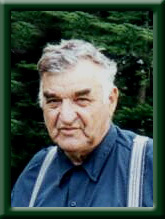 ROY – Morris James, 86, of Southwest Port Mouton, Queens County, passed away suddenly on September 29th, 2011 at home. Born in Southwest Port Mouton, he was a son of the late Silas James and Mabel Leighton (Williams) Roy. Morris was an avid outdoorsman, enjoying fishing, hunting and trapping. He worked well with his hands enjoying carpentry and duck carving. He is survived by his sister Maxine MacDonald of Halifax and many nieces and nephews. He was predeceased by his sisters Pauline Mustard, Winnifred Callahan, Ethel McLeod, Georgina Roy and Rhoda Huphman and his brothers Sterling, Angus and Charles. To the family of Morris Roy, our thoughts and prayers are with you and your family at this time. Morris was a great man, I will miss seeing him on the roads morning as I am doing my mail run. Sorry to hear of the sudden loss of your brother Maxine, and other family members. Morris was a cousin to Brenda’s Dad, Leander Fisher. Sympathy to the family. Maxine, sorry too hear of the loss of your brother, I fished with him for a number of years, he was a good person and I was very fortunate to have know and worked with him. To Aunt Maxine and family members, I am so sorry to hear of the sudden passing of Uncle Morris. We were very fortunate to have had a visit with him, thanks Dale, when we were in Port Mouton for Bev’s service this August. The visit included a tour of his workshop, of course, and lots of picture taking and joking around; all good memories for which I am very thankful. I am so sorry to hear of Morris’ passing. It was an honor to be able to meet him and spend some time with him just a month or so ago in SW Port Mouton. Condolences to all. To all family members we would like to express how sorry we are to hear about Morris passing.Morris always put a smile on our face everytime he walked in to Value Plus Store.It was always a pleasure to assist and serve such a fine person.We are certain that the family and all who knew him will really miss him.Our deepest sympathy to all. To Maxine and family, sorry to hear of Morris’s passing. My Dad spent alot of time with him……Thoughts and prayers are with you at this time. Maxine and family members, we are missing Uncle Morris and thinking about all the visits that he generously shared over the years. Fisherman,outdoorsman,craftsman,patient teacher, curious,sense of humor,are only a few words that describe this important man and community member. Thank you Morris for fixing my sandal when I was14.Your skill turned it into a work of art with the shining copper tacks. Missing you and remembering you well. Uncle Morris will be missed on the wharf where he was a constant presence with other retired fishermen, He will be missed by friends and relatives from far and wide, who would visit him when his basement door was open or when he was outside splitting wood. Whether he used wood to carve birds or needed to make a tool or modify a chair, his talents reflected his ingenuity and love of nature so clearly evident in his carvings. He was the last of four brothers, who although different, belonged to a generation of special human beings that drew me and eventually my wife back again and again to this beautiful and vibrant fishing village – a place we both love. We miss you Uncle Morris. Thank you for being my Uncle and say HI to Mom up there.